Mention 'ballroom dancing' to me and the only image I can conjure would be that of middle-aged folk in ill-fitting suits and dresses prancing around the dance floor. 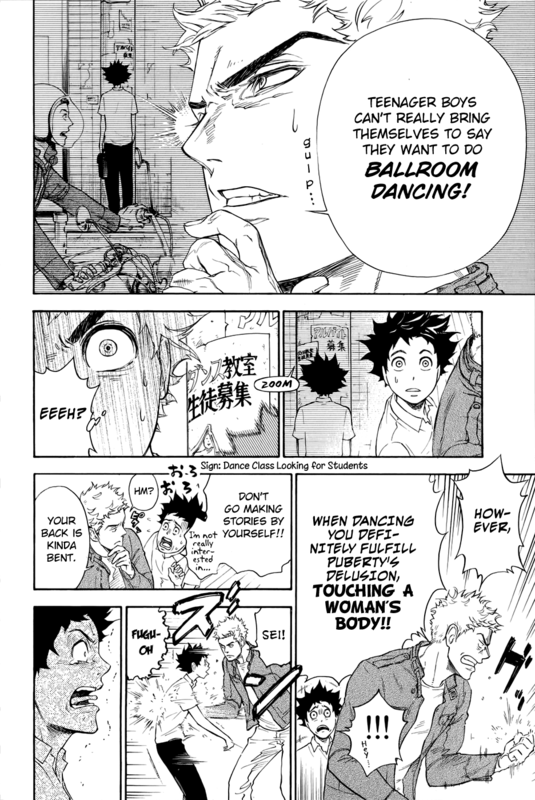 At least that was the perception I had before reading Ballroom e Youkoso. The manga about competitive ballroom dancing was making huge waves in the community and it would be a waste if I didn't give it a few chapters at least. If I could enjoy an anime about ice skating, I'm sure a manga about ballroom dancing would be a piece of cake. 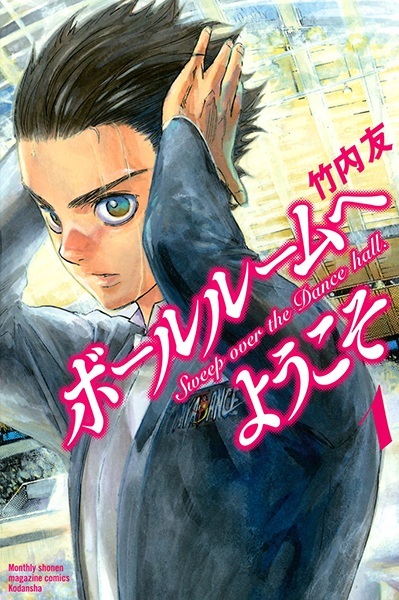 Ballroom e Youkoso revolves around 15-year-old Fujita Tatara as he attempts to become a professional ballroom dancer, despite having no experience in the sport at all. To make matters worse, his introduction to the dance floor is purely accidental, chancing upon a dance studio after a hilarious bullying incident. Although he lacks experience, his sharp eyes and tenacity were crucial to his speedy progress. 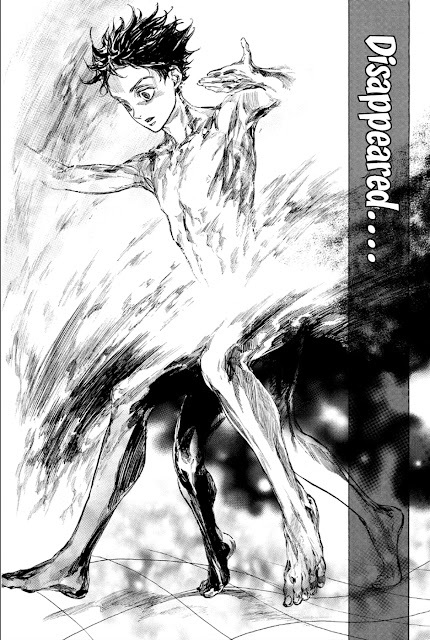 Fortunately, Tatara isn't painted as a prodigy and his lack of experience in competitive ballroom dancing along with his initially poor fitness levels hinder him at various stages in the manga. The large amount of information is easily digested thanks to the many character interactions and succinct explanations. Speech bubbles and text boxes rarely got in the way of the panels and the exposition hasn't affected the pacing yet, despite each chapter being over 40 pages long due to the manga's monthly format. From basic training routines to how the scoring system works, each point and terminology is explained concisely and I understood what the stakes were for Tatara and the other competitive dancers he met along the way. Takeuchi Tomo employs two distinct styles through the course of the manga, with blurred lines, shading and watercolours being employed during segments where the characters dance, be it in practice or in a ballroom. The style is reminds me of Tokyo Ghoul and even Haikyuu!! 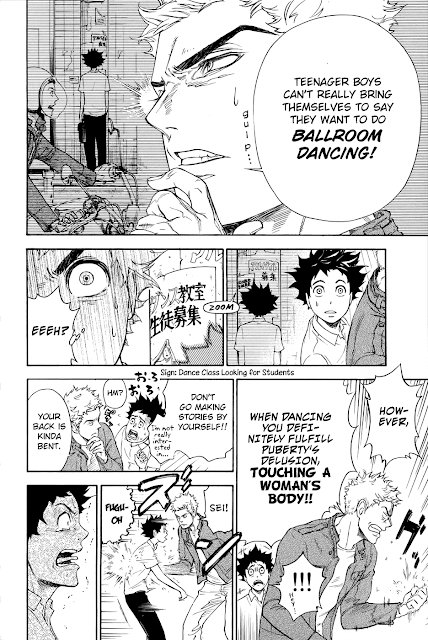 and I enjoyed this method the mangaka uses to show motion when the characters are dancing. That being said, I'm looking forward to Production I.G's anime adaptation next month. There's only so much the manga can do to convey how well or how badly each pair has danced in still frames. Naturally, the cast expands as Tatara becomes increasingly involved in the competitive circuit. Rivals are not one-dimensional and they quickly turn into mentors, giving him much-needed advice and tips. 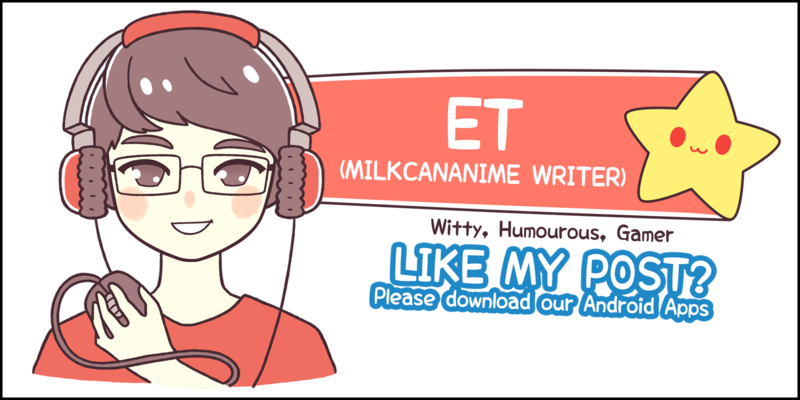 A mercurial one even saves him from bullying after he enrolls into high school in the earlier chapters. The supporting cast is highly entertaining and multi-faceted, managing to carry several chapters on their back. Every one of them has a captivating backstory and strong conviction to succeed. There are only 46 chapters currently and although Tatara is nowhere the level of his peers yet, the competition he faces is still stiff and watching an underdog climb his way to the top always makes for a more entertaining story. It's a pity the manga is on hiatus but like I mentioned earlier, an anime adaptation is airing in less than a month so that's one more title I'm adding to an already busy Summer season. No Comment to " Ballroom e Youkoso "